Still need a Father’s Day gift? Whatever you call your father, you don’t want to disappoint him today of all days, right? Oh, he’ll say it’s OK. That’s to make you feel better. So, delight him with your thoughtfulness. We’re unsure what makes up the Dad equivalent of buying Mom flowers from the grocery store or off-ramp guy. but just say ‘No’. No worries. As long as you have time to stop at the store before the Father’s Day event or gift presentation happens. As with the previous “last minute” posts, all of the choices are from physical retailers. Sure you can buy the usual: cologne, run of the mill watches, slippers, ties, etc. 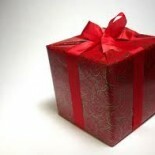 But, why not stand apart with your gift? How much will Daddy enjoy offering guests wine from this Wine Enthusiast Etched Globe Decanter? It will also be quite the conversational piece. Cool factor: the globe revolves. The Sharper Image Rechargeable Electric Wine Opener might better fit his needs. Easy to use 2-button operation. Papa a music fan? Does he still have his vinyl LP collection? Get him several Room Essentials Record Album Frames for his favorites. Papa can also entertain guests with stories as he shows off his collection. Made of aluminum; accommodates double albums. OK, the George Foreman Grill is a classic gift, but it’s also on sale. Plus, it’s a healthy choice for Pops. With the Picnic Time Metro BBQ Tote, DaDa demonstrates his grilling prowess and displays his NFL allegiance. Includes a triple duty large spatula, BBQ fork and tongs. His team logo graces the front of the tote. Or cover Baba’s entire grill with his team colors. The NFL Deluxe Grill Cover provides heavy duty protection for his grill in two ways. Cleans easily. For more team (MLB, NFL, NBA, etc) gift ideas check here. Daddio is going to fry foods no matter what you preach. At least contain that practice with the Farberware Deep Fryer. He could even take the frying out to the patio to prevent smelling up the house. Stainless Steel, easy clean-up. Babayi gets all the benefits of yogurt with none of the detriments with the Euro Cuisine Yogurt Maker. Includes 7 convenient glass jars for preparation and storage. Includes recipe book and instruction manual. Golf equipment and tools. Two areas Papi probably wants organized. Check out Suncast Golf Organizer. Plenty of room and compartments to store all Papi’s golfing essentials, including two golf bags. For his tools, Rubbermaid Deluxe Tool Tower Storage Unit. It will hold 40 of his tools and is easily maneuverable. Papa a music fan? Does he still have his vinyl LP collection? Get him several Room Essentials Record Album Frames, or the set, for his favorites. Papa can also entertain guests with stories as he shows off his collection. Made of aluminum; accommodates double albums. OK, get out there and shop like it’s Christmas Eve. Eyes on the prize, singular purpose. This entry was posted on June 16, 2013 by frugalistagiftguide in Uncategorized and tagged cook, entertainer, Father's Day, Frugal, Frugalista gifts, health guru, last minute gifts.